Did you know that one lorry can be filled with almost 30,000 bottles of beer in just 8 lifts? Matt Hardy, Industry Manager for Hyster Europe, talks about how beverage operations are maximising handling efficiency. How are lift trucks used in today’s beverage industry? Lift trucks are typically used at either end of the production line which tends to be automated. So, they are handling materials coming in, such as ingredients, bottles, bottle tops, cans and packaging, then the finished goods at the other end of the line. These usually come off two at a time, to be stacked three pallets high, although that depends on the weight of the goods. In your opinion, what is the main challenge facing beverage operations? Hyster Europe works with some of the biggest breweries and beverage companies in the world, as well as micro-breweries and niche manufacturers, so we are well placed to understand the challenges that different applications in this industry face. For many, reliability is the most important factor in intense beverage applications. For example, at breweries and soft drinks companies you will often see queues of trailers and lorries waiting to be loaded, so these operations simply can’t afford any truck downtime. Many Hyster® customers in the beverage industry have previously found that other lift truck brands simply can’t perform when the going gets tough, but strength and reliability is exactly what Hyster® trucks are best known for. However, the challenges of the beverage industry are numerous. From providing driver comfort and visibility, reducing damage, restricting access and controlling costs to maintaining and improving cycle times. How can Hyster® solutions help speed up cycle times? For many years we have given drivers in the beverage industry enhanced visibility over the attachment, forks and the associated load through elevated seating positions. 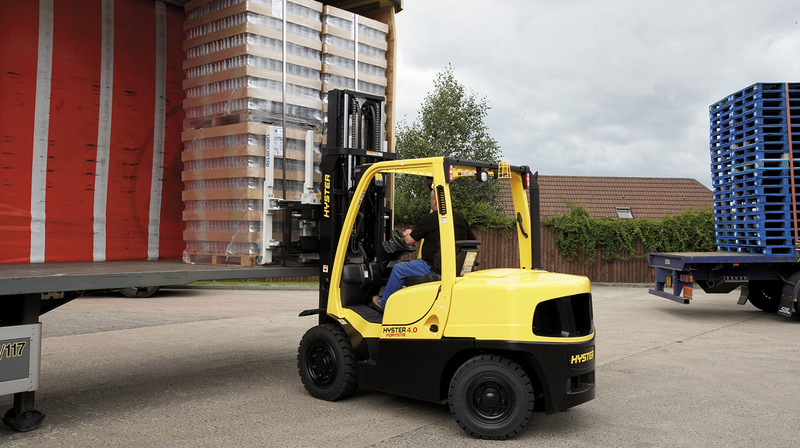 The raised cab option we provide on Hyster® electric lift trucks gives an extra 350mm or 450mm height to the driver, and on the Fortens™ series of diesel and LPG trucks there is an extra 500mm. With more visibility over a full load, which can be up to 1.8m high, operators can comfortably drive forwards over greater distances, reducing driver fatigue and supporting productivity. The enhanced view of the working environment also benefits operators in fast moving applications, such as bottling plants, or where space is restricted. To further enhance the driver environment, some applications also opt for a rotating seat in the cab on our Fortens™ range, for example. This allows the operator to rotate the seat by 15 degrees which can increase comfort, in turn contributing to greater efficiency. But can you significantly increase lorry load time? Double pallet handlers are nothing new but are very well suited to the beverage industry and can help load lorries in half the time, which is significant. For example, a 40ft curtain sided trailer can accommodate 24 UK/CHEP pallets, each of which holds 1200 500ml bottles, or 600 litres of beverage. Lifting two pallets at a time means just 12 lifts are required to load the truck, 6 from either side of the trailer. 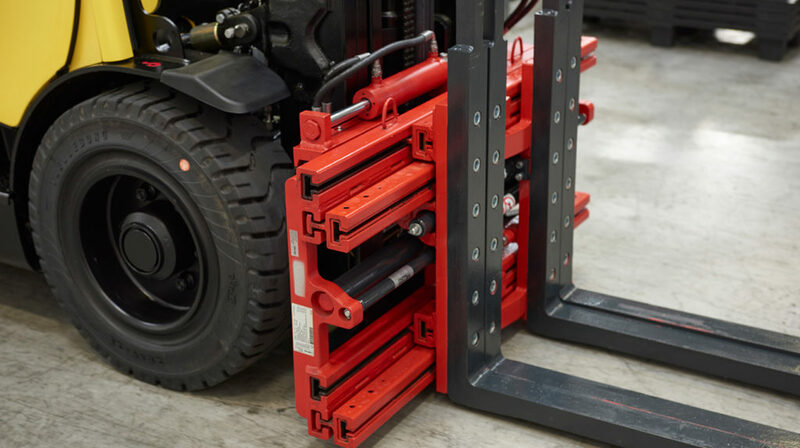 Attachments that can handle 3 or 4 pallets at once are also available to reduce the number of lifts as low as 6 per trailer, which can help further reduce travel time, maintenance and fuel costs. But you’ll need a bigger truck to take the extra weight, and to consider the increased loading area and aisle widths needed. To make things even easier for beverage industry customers, we have recently introduced a factory fit option. 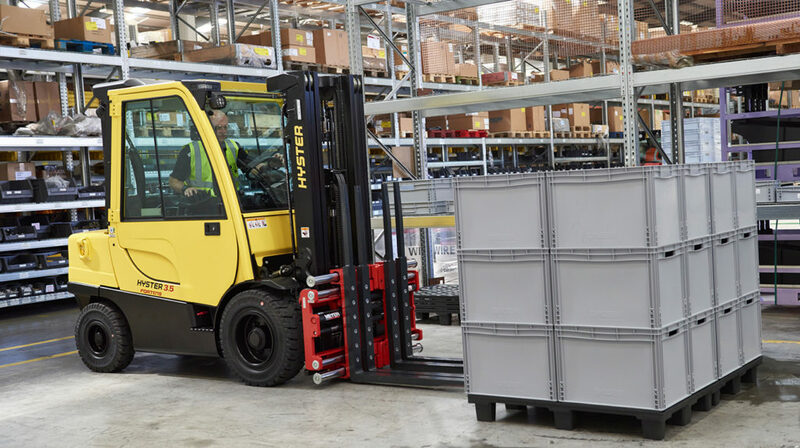 New Hyster® lift trucks with 2 to 4.5 tonne lift capacity can now be fitted with the multi pallet handler for either UK/CHEP or EURO pallets straight from the factory. For our customers in the UK and Ireland, this includes all new diesel and LPG Fortens™ lift trucks and the J series of electric trucks. With this attachment, one or two pallets of bottles, cans or kegs can be handled side by side up to a maximum load capacity of 3,200kg. Hydraulic functions are easily operated from within the driver’s cab giving smooth, fast and synchronised fork adjustment with a separate sideshift. The adjustable fork spread also gives increased pallet support to help minimise damage. The attachments also come with a two-year (or 4000-hour) warranty and there is reduced truck preparation time, as trucks are complete with all hoses and pipe work. Easily exchanged attachments are also available for far more than handling pallets of finished goods. For instance, with a fork mounted waste skip and a rotator attachment, beverage applications have a simple way to empty waste, such as broken bottles, into an outdoor skip bin using their existing lift trucks. This entry was posted in 360-degree benefits, Attachments, Container Stuffing, Counter Balance, Electric, Fortens, Fortens®, FT, Hyster, Hyster Europe, Mounting Solutions, Solution, Warehousing and tagged Beer, beverage industry, Hyster, multi-pallet attachments. Bookmark the permalink.